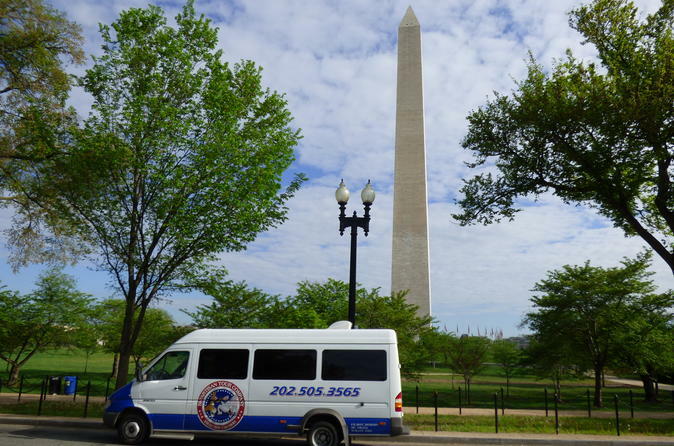 This small-group bus tour in Washington, DC shares stories that everyone from grandparents to grandchildren will enjoy, as well as visitors from other countries. During the course of the 7-hour tour, spend between 10-to-20 minutes at each location. After hearing some great American history, guides will help take photos, then allow for a few minutes of wandering, as desired. At the following locations, the DC tour guide will share the stories of each of these American treasures: the US Capitol building, the White House, the National World War II Memorial, the Thomas Jefferson Memorial, the Franklin Delano Roosevelt Memorial, the Martin Luther King, Jr. Memorial, the Korean War Memorial, the Lincoln Memorial, the Vietnam Veteran's Memorial, the Marine Corps War Memorial, the United States Air Force Memorial, and more. Due to the nature of small groups, sometimes there will be a change to the itinerary based on the desires of the guests that day, especially if family, friends, or groups are the only ones touring. Depending on the group, lunch could also be different every day. Sometimes the group will stop at a restaurant for lunch, other times they will simply grab something and keep going. At times, the following locations may be included during the tour: US Capitol (inside the building), the Library of Congress, the Supreme Court, the White House Visitor Center, the National Building Museum, the John F. Kennedy Center for the Performing Arts, Embassy Row, the National Cathedral, or some of the many great museums, especially if the weather is poor.